The New Jersey Nets selected Cincinnati forward Kenyon Martin with the top overall pick in the 2000 NBA Draft. Martin averaged 12 points and 7.4 rebounds en route to finishing second in Rookie of the Year voting. Martin was also named to the All-Rookie First Team. Martin’s tenure in New Jersey didn’t last long as he was traded to the Denver Nuggets in 2004 in exchange for three first round picks. With the second overall pick in the 2000 NBA Draft, the Vancouver Grizzlies selected LSU forward Stromile Swift. At number three, the Los Angeles Clippers took swingman Darius Miles. The Chicago Bulls chose forward Marcus Fizer fourth overall. While the Orlando Magic rounded out the top five with the selection of sharpshooter Mike Miller. Miller went on to win the Rookie of the Year Award and appeared in all 82 games during the 2000-01 NBA season. 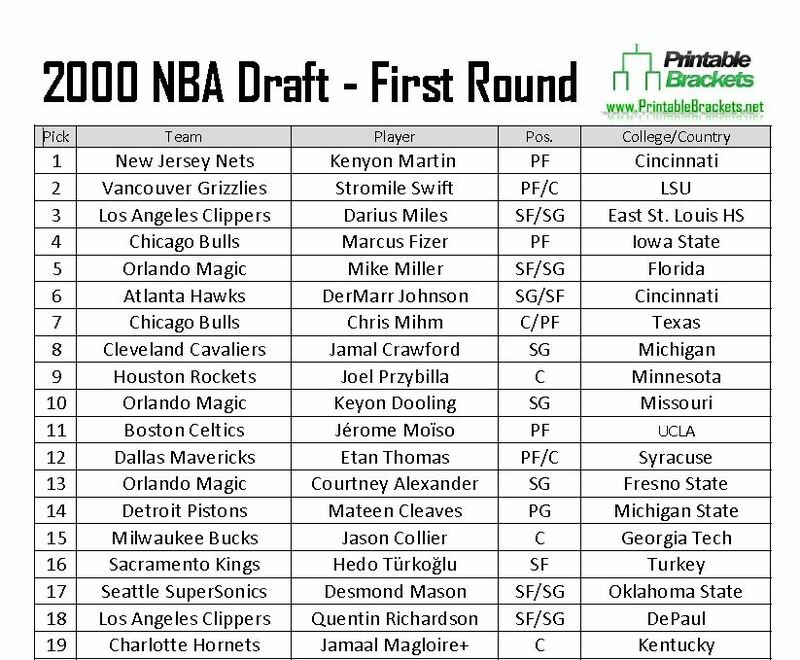 Notable players selected outside the top 10 in the 2000 NBA Draft include Mateen Cleaves, , Hedo Turkoglu, Quentin Richardson, Jamaal Magloire, Morris Peterson, DeShawn Stevenson and Mark Madsen. The most notable players taken in round two was Michael Redd, who was selected by the Bucks with the 43rd overall pick. Redd, Martin and Magloire are the only three players from the 2000 NBA Draft class to ever be named to an All-Star team. Martin, Miller, Milers, Peterson and Marc Jackson were named to the All-Rookie First Team. The most notable players that went unselected in the 2000 NBA Draft were Slava Medvedenko and Malik Allen.